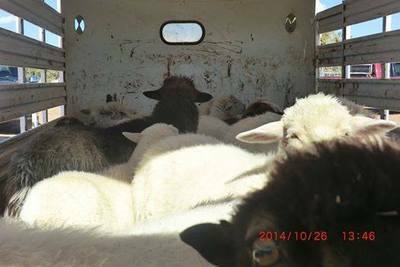 So far, three Black Mesa families have had their entire herds of sheep & goats impounded and are facing fees totaling about $1,000 per family to secure the release of their livestock. More impoundments appear likely in the near future. All funds raised will go directly to Dineh families on the Black Mesa 'HPL' lands who have been aggressively targeted with livestock impoundments starting on October 22, 2014. The Beck Family made a $1000.00 donation. margarita made a $25.00 donation. Charles made a $50.00 donation. Nicholas Segal-Wright made a $25.00 donation. Rachel R Dazey made a $50.00 donation. Kaleigh McGregor-Bales made a $50.00 donation. Brandon Benallie made a $174.50 donation. Catherine Kunkel made a $250.00 donation. Central VT Fundraiser made a $666.00 donation. Movement Generation MG homies made a $150.00 donation. Warren Wilson College Students made a $16.50 donation. Fen Jeffries made a $20.00 donation. natalie r hoffman made a $25.00 donation. treefeather made a $50.00 donation. Jessica Ng made a $25.00 donation. The Lahey Family made a $105.00 donation. E. Johnston made a $25.00 donation. Barbara Kaufman made a $25.00 donation. Rachel Thevenard made a $150.00 donation. Rascal made a $25.00 donation. Ryan Dunn made a $100.00 donation.